If you’re expecting a movie that’s heavy handed in science, then you’re in the wrong one. This story is everything about the love and struggle that was between Stephen Hawking and Jane Wilde; it was absolutely beautiful. The quality of the acting was fantastic because Eddie Redmayne absolutely nailed it. He portrayed so much depth and could make you laugh with a small tick in the face, just like the real Stephen Hawking. Honestly, if it wasn’t for Redmayne, then there would be no movie. 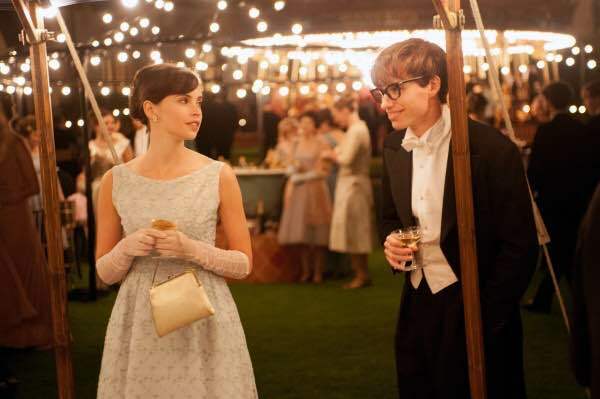 I also have to give props to Felicity Jones who played Jane Wilde because you could see the constant internal struggle she had to deal with in taking care of Professor Hawking. You will tear up in this movie. During a screening for Professor Hawking, even he teared up…so you know this is the real deal. [Source: Focus Features] Please be careful on those rickety bikes….. 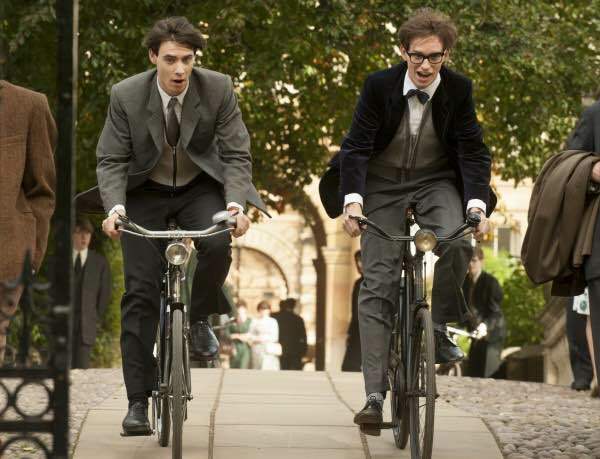 The scenes start off with Stephen (Eddie Redmayne) and colleague, Brian (Harry Lloyd) racing on their bikes off to their Ph. D classes at Cambridge in the 1960s. Afterwards it is shown how Jane (Felicity Jones) and Stephen meet. She looks across the room and you can see the love at first sight connection between the two instantly click. Stephen’s crooked glasses and radiant smile pulls you in. It’s so lovely and awkward the way Stephen approaches Jane. You could feel their relationship beginning to form. The rest of the movie shows Stephen’s tenacity to fight through the motor neuron disease he’s been diagnosed with. The scene where the doctor breaks the news that he only has two years to live is heartbreaking and emotionless. Even though you see this brilliant man slowly degenerate physically, there is never any doubt that his mind is losing any speed. Two years pass and Stephen is still breaking the boundaries of science. He is now married to Jane, and has a baby son. At this point you start to see that Jane is going to have her hands full taking care of Stephen and raising a child. It doesn’t get any easier as they have more children (because certain functions are “automatic). Jane’s love for Stephen is great but raising 3 children, studying for her Ph.D., and caring for Stephen can only stretch it so far. [Source: Focus Features] Their chemistry is amazing. Jane needs help and wants help but Stephen refuses until a certain choirmaster, Jonathan (Charlie Cox) enters their life. Jonathan is an immense help but you can also see the feeling begin to develop between Jane and Jonathan. When Elaine (Eileen Davies), a caregiver that’s hired, comes into the picture, flirting with Stephen…well, you can see where the marriage is headed. The most powerful scene in the movie is between Stephen and Jane, when they realize their marriage has come to an end. When Stephen is bound to the chair and can only speak with his speech synthesizer; he can’t comfort Jane. It’s heart-wrenching. [Source: Focus Features] Working hard. You can do it! 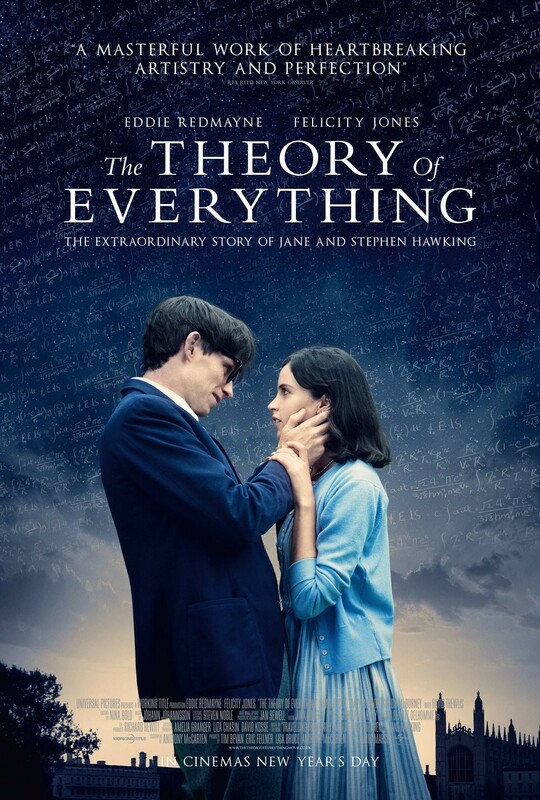 Final Thoughs: “The Theory of Everything” is a must watch; the story is poignantly beautiful. 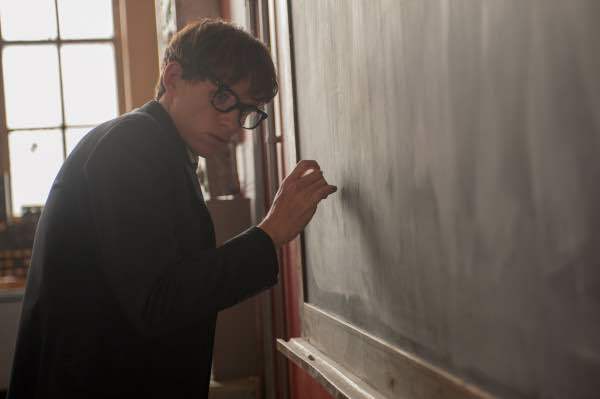 The small nuances and humor that Redmayne portrays of Stephen Hawking is Oscar-worthy. The story flows and is never dull; you’re always aware of the fact that here is a man with one of the most brilliant minds but he’s a prison of his own body. You have Jones’s portrayal of Jane and how she perseveres, tested in the human limits of patience, love, and dedication. The direction and cinematography of this movie is visually stimulating and will hit all your emotions.